September | 2012 | Quo Vadis? According to an article from Bloomberg Business Week, a total of nine states have passed laws requiring a photo ID to vote. Opponents of these laws argue that this requirement may disenfranchise many eligible voters, especially elderly, minority, and low-income citizens. At the heart of this issue is Section 5 of the Voting Rights Act of 1965 (via the Legal Information Institute), enacted as a directive towards certain states where there was a history of “anti-minority election practices.” Section 5 required that these states seek approval from the Department of Justice or a federal court before making any changes to their voting laws. States seeking changes to their voting laws argue that this pre-clearance mandate is both costly and outdated. Many of the states caught up in this legislative battle are the “swing states” whose votes could be determinative in the November elections. In Pennsylvania, for example, preliminary data suggests that the new voter ID law could disenfranchise as much as 9% of the voting population. Given the upcoming presidential election, state courts are trying to work with their colleagues in the legislatures by not undermining their law-making powers while balancing the rights of those voting populations. Furthermore, it is unsurprising that the courts are split on the constitutionality of such laws. In Pennsylvania, the new voter ID law requires voters to present a qualifying, current photo ID to cast a ballot. In the case of Applewhite v. Commonwealth of Pennsylvania, the case contesting the new law, Judge Robert Simpson of the Commonwealth Court did not grant the injunction sought by the challengers. Instead, the Commonwealth denied the injunction based on the “predictive” belief that Pennsylvania government officials would, with enough time before the general election, have a system in place whereby citizens would be able to obtain a qualifying ID. On Tuesday, September 18, the Supreme Court of Pennsylvania vacated the Commonwealth Court’s judgment, skeptical of the government’s plan and ability to have such a system in place with adequate time to avoid disenfranchising some voters. The Per Curiam opinion remanded the case back to Judge Simpson, with a directive to evaluate the feasibility of implementing the plan for voters to obtain qualifying ID in concordance with Pennsylvania’s mandate of “liberal access” to obtaining such an ID. Of the 7-judge panel, two justices voiced their dissent. Justice Debra McCloskey Todd’s opinion cites to the majority’s acknowledgment that the “law is not being implemented according to its terms” considering the short time until the election. Both dissenters agreed on the fact that the majority has, essentially, given the Commonwealth Court another opportunity to “predict” what government officials can do with respect to implementing the law in time for the election. Justice Seamus McCaffery emphasized that, given the facts, circumstances, and time frame, the majority should have taken bolder action in its decision. With the general election less than 2 months away, those of us right across the river from Philadelphia–birthplace of the Bill of Rights–are on the edge of our seats waiting to hear what the Commonwealth Court will have to say. 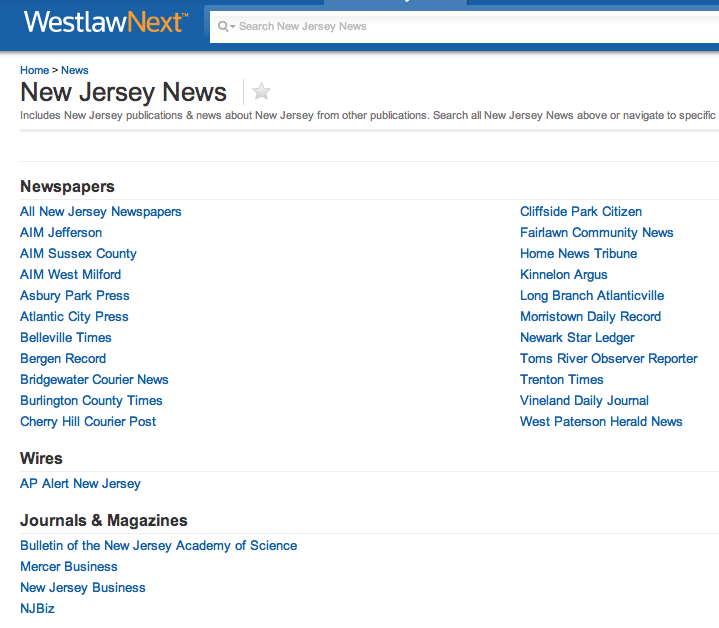 Rutgers Law Students and Faculty can also review the NJLJ (and similar legal newspapers from other cities and regions) online using Lexis Nexis (*UPDATED: see below). 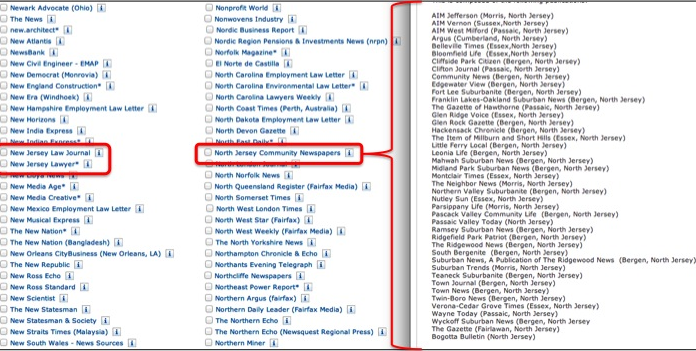 From the main page, select the heading “News and Business,” then select “Individual Publications,” and then select “N” to find the NJLJ. This same path will also reveal a link for North Jersey Community Newspapers, which includes over 40 individual publications from all across northern New Jersey. UPDATE: To get to Lexis.com from Lexis Advance, select the “Research” tab in the top left of the screen. Research options will drop down. Select “Lexis.com” and follow the directions above.